I have a ridiculous stash that I've built up over the past few years. Cotton, knit, fleece, felt and a massive amount of clothes in my refashion pile. I need to start using them so I am going to make sure I make something out of my stash every week. 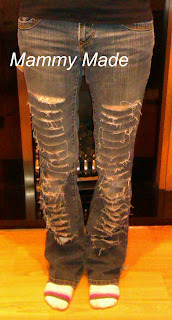 Last night I made these jeans. I loved these jeans, they fit really nice and are sooo comfy. They got a hole in one knee a few months back so I chucked them in my refashion pile, meaning to do something with them but not being quite sure what. A few days ago, I saw this. I thought it looked really good and was thinking I would definitely try that with one of my tops. Then I had a brainwave and thought why not do it to my jeans. I've seen jeans like that before and thought they looked good. 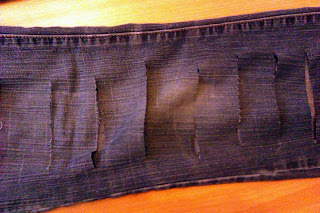 I cut slashes in the front of the jeans (making sure not to cut through to the back). I started a few inches below crotch level and stopped about 3 inches from the bottom so you couldn't see my socks through the slashes. I cut the slashes pretty thick at first but then added more inbetween to make them thinner. Put them through a wash to fray all the edges then try them on. After trying mine on, I think the jeans I used were too baggy in the leg to begin with so they don't really give the look I want. Would be much better with skinny jeans! I still quite like them though. I think I'm going to cut more slashes a bit higher up, they start too far down my leg so the top and bottom are out of proportion. I'm funny about things like that haha. 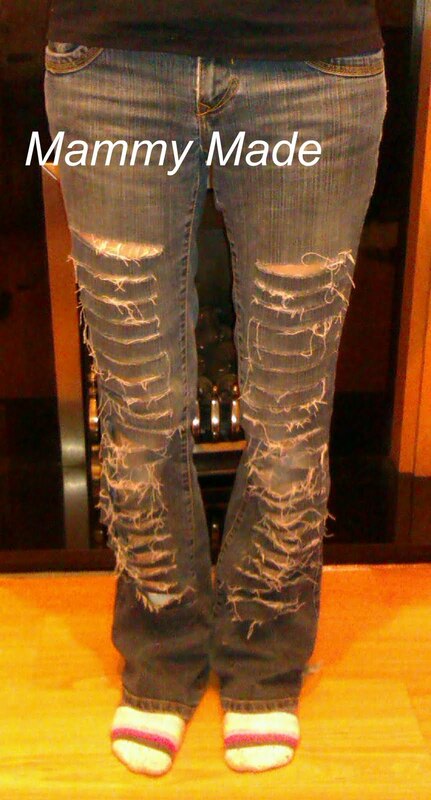 All in all I'd say these jeans were a success, even if they turned out differently to how I imagined they would! Pretty sweet. It would look really cool if you wore neon leggings underneath!